John's father died when he was young, and he was raised by a very pious mother. Well educated; studied rhetoric under Libanius, one of the most famous orators of his day. Monk. Preacher and priest for a dozen years in Syria. While there he developed a stomach ailment that troubled him the rest of his life. It was for his sermons that John earned the title Chrysostom = golden mouthed. They were always on point, they explained the Scriptures with clarity, and they sometimes went on for hours. Made a reluctant bishop of Constantinople in 398, a move that involved him in imperial politics. He criticized the rich for not sharing their wealth, fought to reform the clergy, prevented the sale of ecclesiastical offices, called for fidelity in marriage, encouraged practices of justice and charity. Archbishop and Patriarch of Constantinople. Revised the Greek Liturgy. Because John's sermons advocated a change in their lives, some nobles and bishops worked to remove him from his diocese; he was twice exiled from his diocese. Banished to Pythius, he died on the road. Greek Father of the Church. Proclaimed Doctor of the Church in 451. Born to a wealthy, pious family, the daughter of Dominic and Maria Diomedi. Joined the Benedictines at the monastery of Sante Lucia di Trevi on 4 May 1820, taking the name Sister Maria Luisa Angelica. Served as nurse, sacristan, camerlenga and novice mistress. Elected abbess on 1 October 1837; she served for the rest of her life. Revived obsservance to the Rule of the Order. Devoted to Eucharistic adoration. Received a visions of Christ carrying his cross, of the Sacred Heart of Jesus, and of Jesus as a pilgrim. Born wealthy, but she gave it all up. Her father died when Maria was four years old, and she was raised by her paternal grandparents. Well educated. Joined the Carmelites at Toledo, Spain at age 17 and lived 63 years as a Carmelite nun. Stigmatist. Prioress. In 1600 she was unjustly accused of an offense by one of her sisters; she removed as prioress and isolated for 20 years. Close friend of Saint Teresa of Avila; Teresa trusted her so much that Maria was a test reader for The Interior Castle. Born to the nobility. Entered the abbey of Saint Maurice of Agaune in Switzerland while still very young. Spent thirty years there as a schoolboy, Benedictine monk, and hermit. Accompanied Saint Eustace to Luxeuil Abbey in 614, and became a monk there. Brought the Merovingian nobleman Saint Romaric to the faith. Among his other charities, Romaric founded a Benedictine double monastery of Remiremont Abbey at Habendum in 620, and Amatus served as its first abbot. Benedictine monk at Fleury, France. He led a party of monks sent to retrieve the relics of Saint Bernard from the Lombards. Abbot at the monastery in Lerins, France c.670, taking over a house badly in need of reform. Aigulf worked to restore order and discipline to the house, and many of the brothers supported him, but some resisted, and following a riot by the they conspired to have Aigulf and four of his supporters kidnapped, taken to the island of Capri, Italy, blinded, tortured and murdered. Though not a martyr in the standard sense, he died due to his defense of monastic life. Priest in the diocese of Autun, France. Imprisoned on a ship in the harbor of Rochefort, France and left to die during the anti-Catholic persecutions of the French Revolution. One of the Martyrs of the Hulks of Rochefort. Lay woman in the diocese of Cashel, Ireland. One of the Irish Martyrs. Priest in the diocese of Cashel, Ireland. Martyr. Lay woman in the diocese of Cashel, Ireland. Martyr. Franciscan Friar Minor priest. Martyr. Bishop of Tours, Tertia Lugdunensis, Gaul (in modern France) who built the first church within the walls of the city. Franciscan Friar Minor monk. Martyr. Spiritual student of Saint Martin of Tours in France. Missionary. Bishop of Angers, France c.407. Monk. Abbot at Agaunum, Switzerland. Bishop of Sion, Switzerland. Due to a false accusation, he was exiled from his see, first to Péronne, France, and then Breuil, France; in both places he lived as a model, prayerful monk. Seventh century hermit. Abbot on the Island of Tino near Genoa, Italy. Commemoration of the dedications of the basilicas built on Mount Calvary and the Church of the Holy Sepulchre in Jerusalem. Niece of Blessed Warinus of Corvey. Benedictine nun. Abbess of Hreford in Westphalia (part of modern Germany. Priest. Martyed in the persecution of emperor Licinius. Monk. Spiritual student of Saint Leutfridus. Abbot of La-Croix-Saint-Leuffroi Abbey in France. Martyed in the persecution of emperor Licinius. 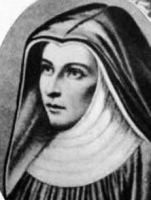 Father of Saint Eugenia of Rome. Saint Protus of Rome and Saint Hyacinth of Rome worked in his home. 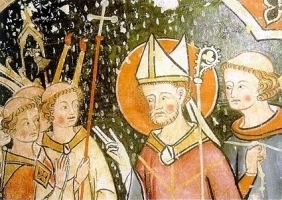 Bishop of Autun, France c.400. Monk. Spiritual student of Saint Deicola. Abbot of Lure in France. First bishop of Valence, Gallia Lugdunensis (in modern France) in the 4th century. Bishop of Autun, France. Friend of Saint Germanus of Paris. Desert-living Christian murdered by a pagan mob. Martyr. Martyred with several unnamed companions.